Elena Shumilova's gorgeous photographs of her children give us a breathtaking glimpse of a day in the life on her idyllic farm in Russia. 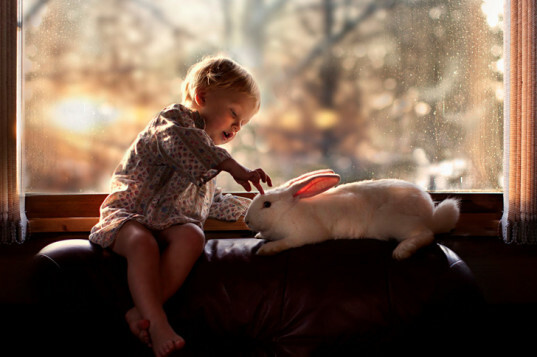 The photographer captures angelic moments between her two young boys and the resident dog, cat, ducklings and rabbits. The beautiful imagery is masterfully created, playing up the soft hues and natural lighting of her bucolic farm. Click through the gallery to see the precious bonds her sons have formed with their beloved animal friends on the farm they call home. Spending her days running a farm, Shumilova has transformed her daily chores taking care of the animals into a collection of picturesque photographs for the world to enjoy. Playing up the innocence of childhood, her fresh faced boys interact with their animal friends with the utmost tenderness. The pair can be seen cuddling, petting and hugging their furry friends, sending a message of universal love to viewers. 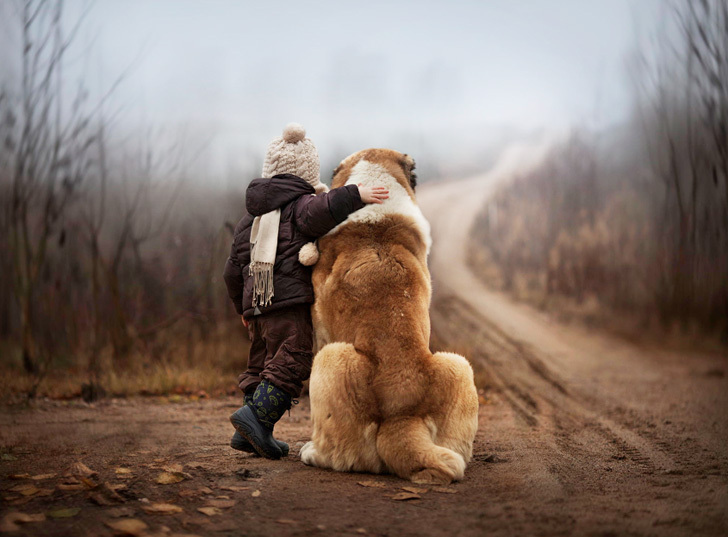 Shumilova’s boys won’t have far to look for sweet memories of childhood, as the photographer has pledged to capture every changing season while they grow up. The photographer loves to play with soft light, using street light, candle light, fog, rain and snow to add to the warm fantastical feeling that each photo captures. Aside from showing the incredible landscapes that surround her home, Shumilova has also become a master at showing the deep love and friendship that can develop between a person and an animal. Bunnies snuggle, fuzzy ducklings gather at the children’s feet, farm cats stop to watch Shumilova’s children as they play, and photos with the family dog show a deep friendship of trust. The beautiful photographs inspire the viewer to relish the simpler things in life. Spending her days running a farm, Shumilova has transformed her daily chores taking care of the animals into a collection of picturesque photographs for the world to enjoy. Playing up the innocence of childhood, her fresh faced boys interact with their animal friends with the utmost tenderness. The pair can be seen cuddling, petting and hugging their furry friends, sending a message of universal love to viewers. Aside from showing the incredible landscapes that surround her home, Shumilova has also become a master of showing the deep love and friendship that can develop between a person and an animal. Bunnies snuggle, fuzzy ducklings gather at the children’s feet, farm cats stop to watch Shumilova’s children as they play, and photos with the family dog show a deep friendship of trust.